As you may have heard, Shazam’s music recognition technology will be incorporated into Siri in iOS 8. Having the ability to identify a song playing in the background (and then purchase it via the iTunes Store) is powerful for mobile devices. But what about those of us sitting in front of our Macs? The answer comes today in the form of the free Shazam for Mac app. Available from the Mac App Store, you simply download, double-click to install, and Shazam keeps an ear out via your Mac’s built-in mic or a microphone plugged into the computer’s microphone port (USB mics are not currently supported). I’ve had a couple of days to play with it and here’s what I’ve seen. Shazam makes itself known by appearing in your Mac’s menu bar and starts listening right away. You can click on its icon and flip its switch to Off if you’d like to disable it. Otherwise it will stop listening if it hasn’t done anything for four hours. Revisit everything Shazam has identified from the Shazam menu. When it hears a song it can identify, a notification appears listing the track title and artist. After a couple of seconds that notification vanishes and the track entry appears not only in Notification Center but also in the Shazam menu. There it’s represented by album artwork, title, artist, and a link for purchasing the track from the iTunes Store. This is useful for those times when you want to revisit tracks that played in the background when you had other things to do. 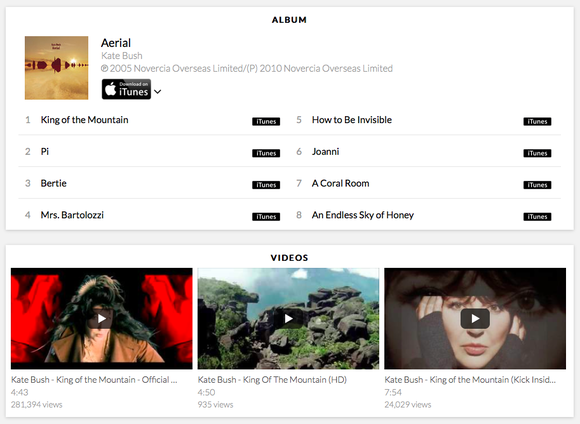 The Shazam site lets you preview all album tracks as well as see related videos. In my brief tests Shazam performed reasonably well. It shrugged its virtual shoulders at a couple of tracks I played via Beats Music (David Starobin’s instrumental piece, “Synchronisms No. 10” and Yes’s “Siberian Khatru,” for example) and it misidentified Roxy Music’s “Prairie Rose” as the group’s “If It Takes All Night.” And there were cases where tracks were identified but lyrics not available. However, if I played reasonably well known tracks chances were good that it would recognize them in a couple of seconds and associated lyrics would be available from the site. Again, Shazam for Mac is free (because the company makes its money from music sales rather than song identification). It’s unobtrusive and handy for when you and your Mac are surrounded by music. I can’t imagine why you wouldn’t download a copy.